As a mom, I am always on the looking for good movies with a good message to share with my family. I love sharing good movies with you, also. That’s why I have done numerous movie reviews in the past. This time I am sharing about a movie that I haven’t even seen yet. The Same Kind of Different as Me opens in theaters on October 20, 2017. The Same Kind of Different as me is from Paramount Pictures/ PureFlix. My family and I have loved every PureFlix movie so far. I highly recommend them all. That’s why I am so excited about sharing this new movie with you. 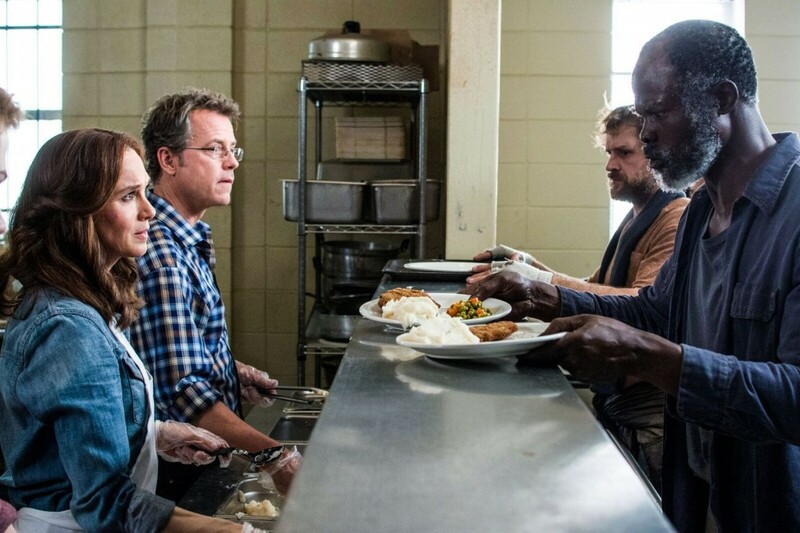 The Same Kind of Different as Me is a drama starring Greg Kinnear, Renée Zellweger, Djimon Hounsou, and Jon Voight. It is rated PG-13, so has a higher rating than most of the movies I recommend for the family. This movie earned it’s rating for thematic elements including some violence and language. “Nobody can help everybody, but everybody can help somebody.” Words of wisdom from a homeless drifter; words that never would be shared with the world if not for a wayward husband, a forgiving wife, and an unforgettable true story that brought the three of them together. With more money than they could ever possibly need, Ron and Debbie Hall have everything they could ever want … except for a loving marriage. When Ron’s unfaithfulness is brought to light, Debbie invites him to stay—as long as he remains truthful and does what she asks of him. But when her request includes serving the homeless at an inner-city rescue mission, Ron would prefer to write a large check instead. Guided by her faith and spurred on by the dream of a homeless man she senses will change their city, Debbie befriends a disenfranchised man named Denver. More surprisingly, so does Ron. Despite vast differences, their lives begin to intersect and they all are changed … forever. 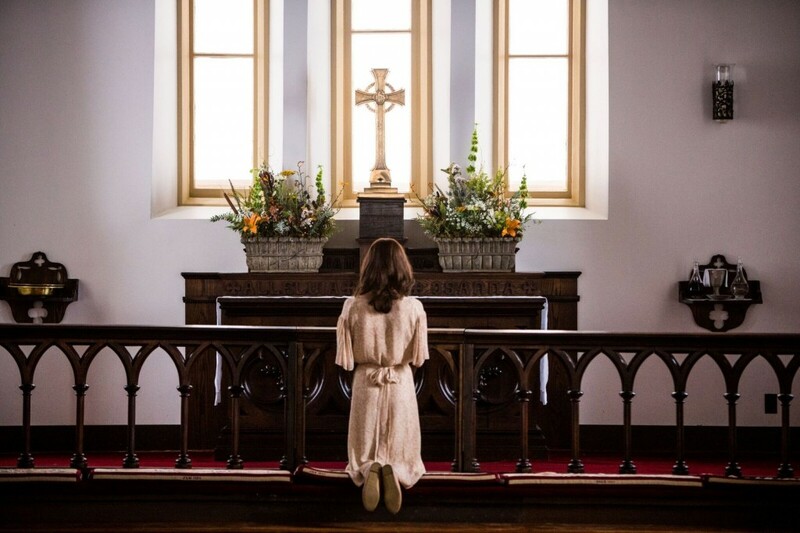 The Same Kind of Different as Me movie has several themes running through out it: Serving, Marriage, Faith, Unity, Reconciliation, Friendship, Purpose. All great themes for a family movie. It think it’s going to be awesome to see them all together in one movie. Check out this behind the scenes video. In addition to the trailer, and the behind the scenes video, I was able to watch an exclusive sneak peek of Same Kind of Different as Me. I loved the scene where Debbie took women from the rescue mission back to her hair salon for makeovers. It’s a very touching scene of helping others feel like they are worth something again. I am really looking forward to going to the theater to see Same Kind of Different as Me with my family. 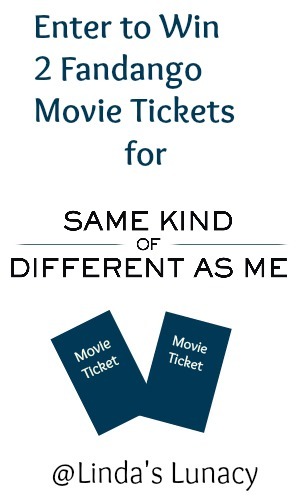 I’m excited to be able to offer the chance for one of you to win 2 Fandango Same Kind of Different as Me movie tickets! To enter, simply fill out the Rafflecopter form below. Be sure to read the terms and conditions on the form! *Disclosure (in accordance with the FTC’s 16 CFR, Part 255: “Guides Concerning the Use of Endorsements and Testimonials in Advertising”): I received one or more of the products or services mentioned above for free in the hope that I would mention it on my blog. Regardless, I only recommend products or services I use personally and believe will be good for my readers. I am disclosing this in accordance with the Federal Trade Commission’s 16 CFR, Part 255: “Guides Concerning the Use of Endorsements and Testimonials in Advertising.” My opinions are my own. Yes, I’m looking forward to this movie. Yes, I’m looking forward to seeing this movie in the theater with my family. Yes, I am looking forward to seeing it very much. Yes, I am looking forward to seeing this movie in the theater! Yes, looks like an interesting movie. Looks like a great movie, one my daughter would like to see with me. This movie looks so inspiring. I really want to see it in the theater. After reading your review, I am very interested in seeing this movie. Yes this seems like it would be so inspiring. Yes I want to see it! Yes I am looking forward to it. I think it will be a good date night movies for my husband and I.
I am very much looking forward to seeing this great movie. The movie looks like its going to be really good with a fantastic story line and excellent actors. I hope I get to see it in the theaters. It looks like a good wholesome movie with great morals. It has a great cast so I would see it. Honestly, this is the first I’ve heard of it, but it sounds excellent!! I can’t wait to see it!!! Yes, this looks like a great movie that I am looking forward to seeing. I would love to see it! Yes, I am excited to see this movie. It sounds like an interesting story. Yes. I’d like to see this movie. I am looking forward to seeing this movie. I think it will be a very powerful movie. Thanks! I cant wait to see this movie with my daughter looks really good. I am very much looking forward to seeing this movie. Sure! I’m crazy about movies. Great cast! Yes, I am looking forward to seeing this in theaters with my mom! YES! Very excited! It was shot in Jackson, MS (I live right outside of Jackson) so this is pretty amazing for our state. The movie sounds amazing and love the fact that they redid the shelter, etc. This looks like a movie both my daughter and I could enjoy.